One of the features of BETT over the last few years has been TeachMeet Takeover. This is where teachers and other people involved in ed tech “take over” a company’s exhibition stand for between 15 and 30 minutes to give a talk, presentation or demonstration to anyone who happens to be interested in what the topic happens to be. Next week sees the annual, and ever-expanding, BETT Show in London. It has been going for more than 20 years, and shows no signs of being irrelevant in the near future. So what exactly is BETT, and should you go? The BETT Show 2009BETT is a huge exhibition, with seminars and presentations playing a supporting role. That is the theory, anyway. In practice, it would be very easy indeed to visit BETT and see almost nothing of the exhibition stands. All it requires is attendance at two or three seminars, a couple of snack breaks, and a meeting or two, and the time has gone. For that very reason, I tend to visit on at least two of the four days. It’s exhausting, but it’s the only way I can get to see things! Unlike the case with a normal conference, especially one that is residential, people don’t so much visit one event, BETT, for several days, but several events, BETT, each lasting for one day. It therefore lacks the sense of cohesion of a conference, even a huge one such as the National Educational Computing Conference in the USA. On the other hand, comparing these single days with other one-day events would also be misleading. A one day conference usually caters for a relatively small number of people (perhaps 100 or so at the most), and has a restricted number of alternative options – if any. Is any of this relevant? I think it is, because if you have never been before the vastness of it could come as a shock. Planning is, I think, essential, even if it’s a fairly loose plan like “Morning: seminar; afternoon: exhibition”. I’ll be covering that side of things tomorrow. Furthermore, the nature of BETT does, as far as I am concerned, provide justification for asking for two or more days out of school (or wherever you happen to work). Become (re-)energised and stimulated from the “buzz”. Best value. If you are considering major new purchases, such as Learning Platforms or interactive whiteboards, you really ought to look at all the options available. Show prices. Exhibitors at BETT often have special show prices, which are lower than their usual rates. It may be worth attending the show to take advantage of such discounts. Professional development. By attending seminars and talking to people on the stands, you will find out ways of improving what you do, which can only benefit the workplace. News update. If you decide to attend on the first day, you will be first in line to hear whatever new initiative or (with luck) new funding the Education Secretary has up his sleeve, which will put you in a prime position to advise the school in a hot-off-the-press way. I hope to be publishing an article about his talk. You can bolster your case by ensuring, as far as possible, that any potential inconvenience to others is minimised, eg by attending on a day or days when you have fewer teaching commitments, if possible. Other teachers. The more who go, the more scope you have for dividing BETT between you. For example, one could look at Learning Platforms, whilst another looks at software. Similarly, more seminars can be covered between you. It may be better for the school if different people attended on different days. However, an advantage of everyone going on the same day is that people tend to talk on the way home about what they have learnt. In other words, they usually end up doing more work than they might otherwise have done – that should please the Headteacher or Principal! Technicians and other support staff. If you are to have a shared vision for educational ICT in your school, it is essential for support staff to be included in professional development opportunities, especially BETT. Take the earlier example, ie let’s assume that you are in the market for a Learning Platform. Technical staff can ask the sorts of questions that affect the underlying robustness of the hardware. For example, is it easy to create resources, is it easy to back them up? What about the transition from your current VLE (if you have one) to the new Learning Platform? Is it easy to give different people different levels of access? Similarly, classroom assistants can ask the sort of practical questions that you may not think of. For example, is it easy to change the cartridges in this new printer – especially when there is a class full of kids milling around? I hope you found this useful, because there's even more to come! Tomorrow: Preparing for BETT. I’ll be sharing at least 13 ‘secrets’ about what to do even before you get to BETT. Friday: Getting the Most Out of BETT. I’ll be suggesting at least 15 things to do while you’re at the show. Monday: After the Show. 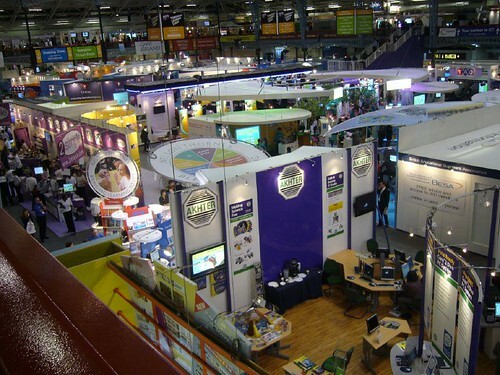 Here you’ll find at least 7 ways to capitalise on your attendance. Why do I keep saying ‘at least’? Because I might think of more! To find all of these articles (and other relevant ones) once they've been published, use the BETT2010 tag on this website.